Restaurants Inc.’s origin dates all the way back to 1985 when the original partners, Gayle Carstens and Michael Crowley brought the Old Country Buffet restaurants to Omaha. In the following years the two partners brought Champps Americana and The Great American Bagel concepts to Omaha as well. In 1997 Carstens and Chef John Ursick created Stokes Grill & Bar, eventually opening a second location in the Historic Old Market District in downtown Omaha. The pair along with Luke Wilson, Brendan Crowley and John Wade created and opened another original concept in 2008 in the Old Market, The Twisted Fork Grill & Saloon. Through the years Gayle created and opened several local restaurants including Genji Teppenyaki Steakhouse, The Brick Oven Café & Bakery and Loco’s Mexican Grill. Carstens, Wilson and Crowley teamed up in 2001 to bring the first HuHot Mongolian Grill to Omaha. Following the success of their first store they went on to open an additional 21 HuHot’s across Nebraska, South Dakota, Iowa and Kansas. The three went on to open two Smashburger’s in Iowa and followed that with adding another 10 Pepper Jax Grill’s in Iowa, South Dakota and Kansas. Gayle downsized in 2016 and now as sole owner of Restaurants Inc. owns and operates the two Stokes Grill & Bars, The Twisted Fork, Taxi’s Grille & Bar and the new Stokin’ Goat restaurant in west Omaha. Taxi’s Grill, a fixture in west Omaha for the past 18 years, was acquired in the fall of 2017. 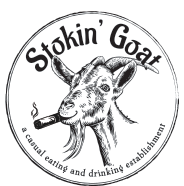 Gayle then teamed up with Chef Andrew Loughery to create the Stokin’ Goat restaurant. This “casual eating and drinking establishment” was opened in West Omaha in the spring of 2018. Restaurants Inc.’s Ellen Osborn, our Director of Banquets and Catering has created a comprehensive catering menu utilizing all four restaurant concepts and catering for up to 400 guests. We also offer private party and meeting rooms at all five restaurants ranging in size from 10 to over 200 guests. Restaurants Inc. has “A place for every taste”.